To Dog With Love: Blessing of the Pets: Rocco My Soul! Blessing of the Pets: Rocco My Soul! 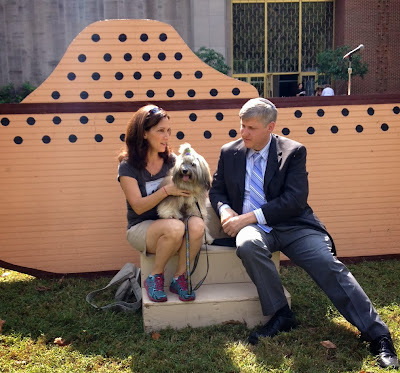 This weekend at churches -- and at least one synagogue that we know of -- pets of all types were celebrated as part of the annual Blessing of Pets. A few years ago I took Cosmo to one of the blessing celebrations at a local church. It was a terrific event and a wonderful ceremony for all the pets. So I was especially excited to learn that our local synagogue was conducting a blessing yesterday. Ahavath Achim Synagogue in Atlanta conducted the event with Northside United Methodist Church. It was held outside on the grounds of the synagogue where folks gathered with their pets and each one received a blessing. Before our blessing, Rabbi Rosenthal chatted with us and asked about Rocco. He wanted to know what I wished for Rocco and he wanted to know if I had any concerns. We chatted some about Rocco's activities, his overall terrific dogginess and my wish for his continued good health. 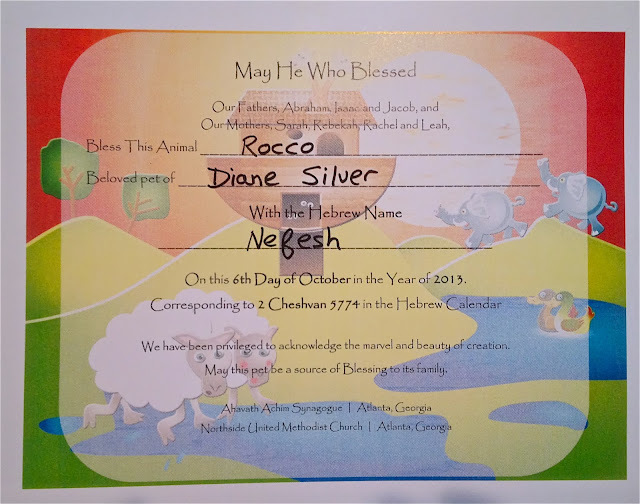 Because this was a Jewish blessing, we were asked to choose a Hebrew name for our pets. I chose Nefesh, which means soul ... a fitting name for soul pup like Rocco whose name also causes me sometimes to break out in song, singing "Rocco my soul in the bosom of Abraham!" Check out this version of the song. It's bound to make you smile and want to get up and dance! 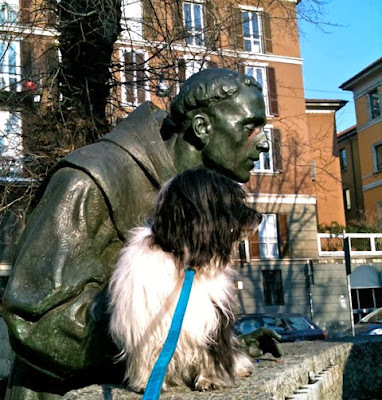 Each October, the annual blessings of pets are conducted in remembrance of St. Francis of Assisi, the patron saint of animals and the environment. Today we're also participating in the weekly Monday Mischief Blog Hop brought to you by Alfie's Blog, Snoopy's Dog Blog and My Brown Newfies. How nice that Rocco was able to be blessed at your local synagogue. oh dear, why are my eyes watering? What a perfect name. I know, isn't that cool? I'm glad to see they are open-minded! We just missed a celebration but apparently they're offering to do house calls. That cool Diane. I've heard of the Blessing of the Pets before and I've always wanted to do it for the Newfs but I always seem to miss it! I wish we had a church here in our area that participated! I think it's cool that you go a certificate, too! I like the certificate too! We didn't get one at the blessing we went to several years ago. What a wonderful event shared by multiple faiths!! We went to the Blessing at our Church. Oh cool! We took Cosmo to Italy twice. He especially loved the Trentino area where we went snowshoeing! I'd love to take Rocco there. Maybe next year. I think he's almost old enough to make the trip! I think this is so great! Unity of Nashville now has an Animal Ministry. You can even send in prayer requests. I've sent several in for friends with sick pets. All animals are welcome, and http://www.unityofnashville.org/tp40/page.asp?ID=313221 is where to go if you have prayer requests for your pets. I think a ton of churches or synagogs do that on the same day each year. We have never gone as there is a huge crowd, but it sounds neat. Thank you for inviting us! I told the Rabbi I wanted Lily to continue to experience and demonstrate joy this year. He said that was a beautiful prayer and that he wished that for all of us!! I am staгting up a online blog directory and was wondering if I can submit your website? Hurrah! Finally Igot a weblog from where I know how to genuinely take helpful facts regarding my study and knowledge.